At our weekend morning ritual gathering at Peets coffee in Manhattan Beach CA (shoot the bull and remedy the world issues) our friend DaveR fights off all others, at all costs, to get possession of the LA Times Sudoku. This morning the concept of a Sudoku Language was born with Klep-doku – the act of stealing someones Sudoku. With a Facebook posting and Tweet on this subject others began to add to the Sudoku dictionary (Howie seems to be the early leader). Add your Word to impromptu SudokuPedia – as a comment below. I love it. We now need an app for it. PolyDoku- The ability to solve several puzzles at once. kung-fu-doku- Solving the puzzle with ancient chinese methods of concentration. Feng-shuidoku- Insuring spatial arrangment of the puzzle on the table to give you the best flow of energy to insure a puzzles completion. ToGoKu -tearing the sudoku out of the paper an leaving with it. withmypoo-do-ku- the act of doing the puzzle at Peet’s with your dog. 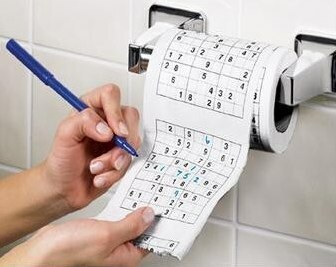 ablutoduko – Playing sudoku while washing oneself.